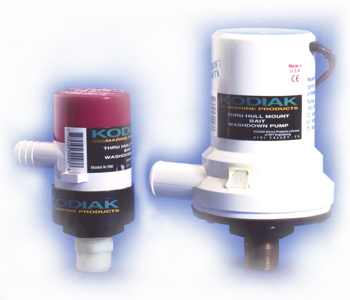 Kodiak transom-mount bait pumps are available in 6 sizes for mounting under water on the transom, flush with the bottom of the boat. Models KB-360 through KB-1100 come with a quick-mount system for fast removal back at the dock. Models KB-1500 and KB-2000, high-out-put pumps, feature a solid aluminum anodized bracket to support the pump. The built-in downward angle of the bracket allows water pickup while moving. You won't have to worry about salt rusting out this pump! Its non-corrosive design will stand up to even the harshest environment. Low amperage per gallon of water output ration is another real plus for boats with limited charging systems. 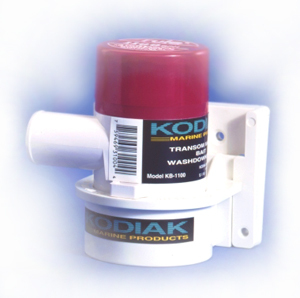 All Kodiak pumps are whisper quiet, so you won't scare the fish away. Thru-Hull models feature full port 3/4" female pipe thread for direct thru- hull mounting.